For twenty years I have worked in the equine collectibles industry making highly realistic small-scale figurines of horses. When people ask what I do for a living, I am always tempted to say that I color in horses. Granted I do a bit of sculpting, and a fair bit of mold-making, but the rest is a lot like having a three-dimensional coloring book of horses. Adding color is my favorite part of what I do in the studio. 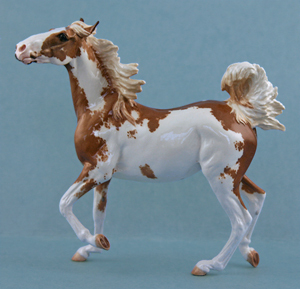 My initial desire was to understand horse color so that I could make the horses I created as realistic as possible. From there my interest grew, until I was spending almost as much time researching horse colors and patterns as I was painting them. In 1992, I began publishing articles with the hope of helping other artists accurately portray colors and patterns. Not long after, I began to get requests for articles from the horse community. In 2001, I was asked to give a presentation in Lexington, Kentucky, alongside Dr. Phillip Sponenberg, whose 1983 book Horse Color had sparked my initial interest in the subject all those years ago. That experience convinced me that while my background might seem unconventional, it offers some unique insight into the visible expression of coat color genes. In 2009, I decided that while I was not ready to invest the time in a full-scale book, I would undertake a small guidebook on the colors found in the various breeds. To help artists know which colors can occur in which breeds, I have published a set of charts for years. The idea was to simply flesh out the information on the charts, as well as add a few of the lesser-known breeds, and publish it. That was the idea, but I started having trouble with scope. (This is a common issue for me.) The book grew until they became several books, and covered not just the colors as they are currently found, but the historical context for each breed. The simple guidebook is now a – still not entirely finished – three-volume set, the first of which is scheduled for publication in the late summer of 2011. It is my hope that this blog will prove useful for discussing the material in the books, as well as for sharing information on horse breeds and their colors and patterns. While the book collection here at the house is a testament to the value I give printed books, the informal nature of blog posts – as well as the interactive nature of the medium – comes far more naturally to me. I am looking forward to the conversation! Hi I’m an atrist & have had horses my whole life/your work is very nice!would like to see more! I will have to put up more images on this page. I am afraid I have neglected it – and my artwork – for the last few months! hi I’ve read your posts about dog coloring and would love to ask you if you have any comments about my dog (blue fawn), could you please email me? I stumbled on your blog from the posts you’ve made about dog coloring (doing research on double merle’s). Anyway I randomly found these via a dog trainer friend on Facebook and thought you’d like the info (if you don’t already know about them lol). And the Curly Coated Horse! Thank you for a fascinating blog. I am still reading, and enjoying every entry. Hi I love reading your blog! It’s incredibly interesting and useful for my paintings!=) I know an interesting-looking horse and have some pictures of him that I’d like to send you, but I can’t find on the website how to contact you. Hello Pilar, and I am glad you are finding the blog useful. You can contact me by clicking the image of the horse under the “Contact Me” button to the right of the page. If that does not work, try leslikathman at eartlink dot net. Oh, and it will most likely get caught by my (overactive) spam filter, especially if you attach photos. Don’t worry if you get a message to that effect, because I routinely check the filter.